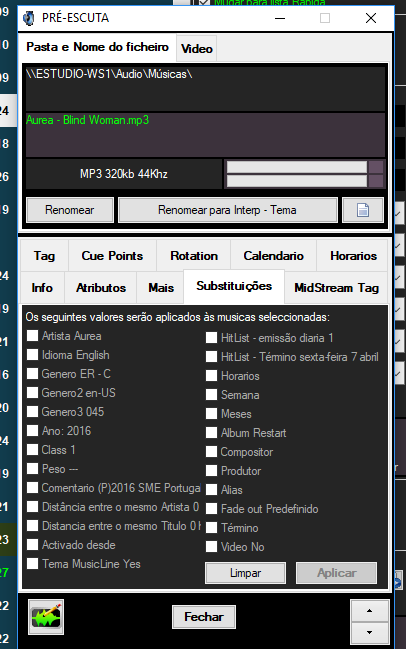 For Portugal in MBMusicReport it would be possible to put the option Language, Gender, Gender2 and Gender3? This already worked for the Portuguese Radio Law. Thank you very much. I'll try. 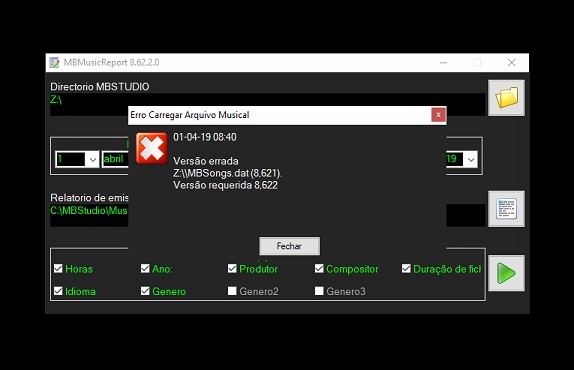 I installed version 8.62.2.0 but every time MBMusicReport opens this message. I was thinking of using the genres of MBStudio to put this information into the Law and Portugal of Portuguese music. However I had another idea that may be simpler and that does not interfere with the function of MBStudio. Last edit: 3 weeks 2 days ago by Medeiros. for the "code" i can add to print that value in the MusicReport. Yes, my idea was that. I'm just afraid that this information might later interfere with MBStudio's programming functions. So be saying to put in "Info" of songs. i think you can use genre2 and genre3 without problem to store nationality and expression. Last edit: 3 weeks 2 days ago by MB SOFT. MB SOFT wrote: i think you can use genre2 and genre3 without problem to store nationality and expression. If you think there's no problem with the genres, fine. OK. I am waiting for the update of MBMusicReport with the code and insertion date of the song, to be YYYY-MM-DD (example: 2019-03-12). I think you have to use the capo "Comment" because "code" does not have to apply to multiple files. Last edit: 3 weeks 1 day ago by Medeiros.